"Hollow point" redirects here. For other uses, see Hollow point (disambiguation). .357 Magnum rounds. Left: Jacketed soft point (JSP) round. 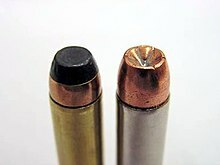 Right: Jacketed hollow-point (JHP) round. JSP is a semi-jacketed round as the jacket does not extend to the tip. A hollow-point bullet is an expanding bullet. It is used for controlled penetration, where over-penetration could cause collateral damage (such as aboard an aircraft). In target shooting, they are used for greater accuracy due to the larger meplat. And although a pointed bullet has a higher ballistic co-efficiency (BC), it's also more sensitive to bullet harmonic characteristics and wind deflection, thus making hollow point bullets consistently more accurate and predictably so. Plastic-tipped bullets are a type of (rifle) bullet meant to confer the aerodynamic advantage of the spitzer bullet (for example, see very-low-drag bullet) and the stopping power of hollow point bullets. 6.5×55mm Swedish before and after expanding. The long base and small expanded diameter show that this is a bullet designed for deep penetration on large game. The bullet in the photo traveled more than halfway through a moose before coming to rest. When a hollow-point hunting bullet strikes a soft target, the pressure created in the pit forces the material (usually lead) around the inside edge to expand outwards, increasing the axial diameter of the projectile as it passes through. This process is commonly referred to as mushrooming, because the resulting shape, a widened, rounded nose on top of a cylindrical base, typically resembles a mushroom. The greater frontal surface area of the expanded bullet limits its depth of penetration into the target, and causes more extensive tissue damage along the wound path. Many hollow-point bullets, especially those intended for use at high velocity in centerfire rifles, are jacketed, i.e. a portion of the lead-cored bullet is wrapped in a thin layer of harder metal, such as copper, brass, or mild steel. This jacket provides additional strength to the bullet, increases penetration, and can help prevent it from leaving deposits of lead inside the bore. In controlled expansion bullets, the jacket and other internal design characteristics help to prevent the bullet from breaking apart; a fragmented bullet will not penetrate as far. A fired .38 Special hollow-point bullet viewed from the side, showing the intended terminal ballistics sometimes referred to as mushrooming. An expanded 124-grain 9×19mm Luger jacketed hollow-point. For bullets designed for target shooting, some such as the Sierra "Matchking" incorporate a cavity in the nose, called the meplat. This allows the manufacturer to maintain a greater consistency in tip shape and thus aerodynamic properties among bullets of the same design, at the expense of a slightly decreased ballistic coefficient and higher drag. The result is a slightly decreased overall accuracy between bullet trajectory and barrel direction, as well as an increased susceptibility to wind drift, but closer grouping of subsequent shots due to bullet consistency, often increasing the shooter's perceived accuracy. The manufacturing process of hollow-point bullets also produces a flat, uniformly-shaped base on the bullet which allegedly increases accuracy by providing a more consistent piston surface for the expanding gases of the cartridge. Match or target hollow-point bullets are designed for precision target use and no consideration is given to their expansion or other terminal ballistic performance. The United States military uses open-tip ammunition in some sniper rifles due to its exceptional accuracy. This ammunition is arguably not prohibited by military convention in that the wounds that it produces are similar to full metal jacket ammunition in practice..
A hollow-point boat-tail bullet is a match-grade bullet design that uses the concept of a teardrop-shaped tail to give it a lower drag coefficient and make it produce less turbulence in its wake. Only the base of the bullet has a boat tail-like shape – the meplat is still pointed. Some hollow-point boat-tail bullets with longer, more aerodynamic profiles are known as very-low-drag bullets. Three fired .22 caliber hollow-point bullets, recovered after being fired into water. To the left is a bullet of the same type that has not been fired. Terminal ballistics testing of hollow point bullets is generally performed in ballistic gelatin, or some other medium intended to simulate tissue and cause a hollow point bullet to expand. Test results are generally given in terms of expanded diameter, penetration depth, and weight retention. Expanded diameter is an indication of the size of the wound cavity, penetration depth shows if vital organs could be reached by the bullet, and weight retention indicates how much of the bullet mass fragmented and separated from the main body of the bullet. How these factors are interpreted depends on the intended use of the bullet, and there are no universally agreed-upon ideal metrics. Solid lead bullets, when cast from a soft alloy, will often deform and provide some expansion if they hit the target at a high velocity. This, combined with the limited velocity and penetration attainable with muzzleloading firearms, meant there was little need for extra expansion. The first hollow-point bullets were marketed in the late 19th century as express bullets, and were hollowed out to reduce the bullet's mass and provide higher velocities. In addition to providing increased velocities, the hollow also turned out to provide significant expansion, especially when the bullets were cast in a soft lead alloy. Originally intended for rifles, the popular .32-20, .38-40, and .44-40 calibers could also be fired in revolvers. With the advent of smokeless powder, velocities increased, and bullets got smaller, faster, and lighter. These new bullets (especially in rifles) needed to be jacketed to handle the conditions of firing. The new full metal jacket bullets tended to penetrate straight through a target causing less internal damage than a bullet that expands and stops in its target. This led to the development of the soft point bullet and later jacketed hollow-point bullets at the British arsenal in Dum Dum, near Calcutta around 1890. Designs included the .303" Mk III, IV & V and the .455" Mk III "Manstopper" cartridges. Although such bullet designs were quickly outlawed for use in warfare (in 1898, the Germans complained they breached the Laws of War), they steadily gained ground among hunters due to the ability to control the expansion of the new high velocity cartridges. In modern ammunition, the use of hollow points is primarily limited to handgun ammunition, which tends to operate at much lower velocities than rifle ammunition (on the order of 1,000 feet per second (300 m/s) versus over 2,000 feet per second). At rifle velocities, a hollow point is not needed for reliable expansion and most rifle ammunition makes use of tapered jacket designs to achieve the mushrooming effect. At the lower handgun velocities, hollow point designs are generally the only design which will expand reliably. Jackets that are thinner near the front than the rear to allow easy expansion at the beginning, then a reduced expansion rate. Partitions in the middle of the bullet core to stop expansion at a given point. Bonding the lead core to the copper jacket to prevent separation and fragmentation. Fluted or otherwise weakened jackets to encourage expansion or fragmentation. Posts in the hollow cavity to cause hydraulic expansion of the bullet in tissue. While very effective in lightly clothed targets, these bullet types tend to plug up with heavy clothing materials that results in the bullet not expanding. Solid copper hollow points, which are far stronger than jacketed lead, and provide controlled, uniform expansion even at high velocities. Plastic inserts in the hollow, which provide the same profile as a full-metal-jacketed round (such as the Hornady V-Max bullet). The plastic insert initiates the expansion of the bullet by being forced into the hollow cavity upon impact. .45 ACP Federal HST 230gr hollow point cartridge, with two rounds of CCI Standard Velocity .22 LR for comparison purposes. .40 S&W round, complete cartridge and expanded bullet. 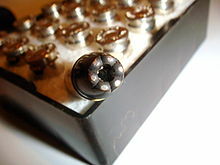 A 9mm hollow point cartridge, along with unexpanded and expanded bullets; expanded lead bullet and copper jacket are separated. 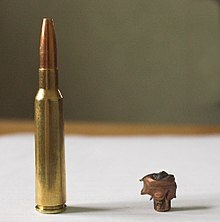 The Hague Convention of 1899, Declaration III, prohibited the use in international warfare of bullets that easily expand or flatten in the body. It is a common misapprehension that hollow-point ammunition is prohibited by the Geneva Conventions, however the prohibition significantly predates those conventions. The St. Petersburg Declaration of 1868 banned exploding projectiles of less than 400 grams, along with weapons designed to aggravate injured soldiers or make their death inevitable. NATO members do not use small arms ammunition that is prohibited by the Hague Convention and the United Nations. In many jurisdictions, even ones such as the United Kingdom, where expanding ammunition is generally prohibited, it is illegal to hunt certain types of game with ammunition that does not expand. The United States is one of few major powers that did not agree to IV,3 of the Hague Convention of 1899, and thus is able to use this kind of ammunition in warfare, but the United States ratified the second (1907) Hague Convention IV-23, which says "To employ arms, projectiles, or material calculated to cause unnecessary suffering", similar to IV-3 of the first Convention. For years the United States military respected this Convention and refrained from the use of expanding ammunition, and even made special FMJ .22LR ammunition for use in High Standard pistols that were issued to the OSS agents and the Savage Model 24 .22/.410 combination guns issued in the E series of air crew survival kits. The US Army has mentioned that it has been considering using the ammunition for side arms, with a possible start date of 2018. The state of New Jersey bans possession of hollow point bullets by civilians, except for ammunition possessed at one's own dwellings, premises, or other lands owned or possessed, or for, while and traveling to and from hunting with a hunting license if otherwise legal for the particular game. The law also requires all hollow point ammunition to be transported directly from the place of purchase to one's home or premises, or hunting area, or by members of a rifle or pistol club directly to a place of target practice, or directly to an authorized target range from the place of purchase or one's home or premises. In early 1992, Winchester introduced the "Black Talon", a newly designed hollow-point handgun bullet which used a specially designed, reverse tapered jacket. The jacket was cut at the hollow to intentionally weaken it, and these cuts allowed the jacket to open into six petals upon impact. The thick jacket material kept the tips of the jacket from bending as easily as a normal thickness jacket. The slits that weakened the jacket left triangular shapes in the tip of the jacket, and these triangular sections of jacket would end up pointing out after expansion, leading to the "Talon" name. The bullets were coated with a black colored, paint-like lubricant called "Lubalox," and loaded into nickel-plated brass cases, which made them visually stand out from other ammunition. While actual performance of the Black Talon rounds was not significantly better than any other comparable high performance hollow-point ammunition, the reverse taper jacket did provide reliable expansion under a wide range of conditions, and many police departments adopted the round. Winchester's "Black Talon" product name was eventually used against them. After a high-profile mass shooting at a large law firm at 101 California Street, San Francisco in 1993, media response against Winchester was swift. "This bullet kills you better", says one report; "its six razorlike claws unfold on impact, expanding to nearly three times the bullet's diameter". A concern was raised by the American College of Emergency Physicians that the sharp edges of the jacket could penetrate surgical gloves, increasing the risk of blood-borne infections being transmitted to medical personnel treating the gunshot wound. While plausible, there are no recorded cases of such an infection occurring in relation to the Black Talon bullets. Winchester responded to the media criticism of the Black Talon line by removing it from the commercial market and only selling it to law enforcement distributors. Winchester has since discontinued the sale of the Black Talon entirely, although Winchester does manufacture very similar ammunition, the Ranger T-Series and the Supreme Elite Bonded PDX1. The hollow point and soft-nosed bullets are both sometimes also referred to as dum-dums, so named after the British arsenal at Dum Dum, in present north Kolkata, India, where it is said jacketed, expanding bullets were first developed. This term is rare in North America, but can still be found in use, usually in the news media and sensational popular fiction, as well as in video games (such as Crimson Skies). Recreational shooters sometimes refer to hollow points as "JHPs", from the common manufacturer's abbreviation for "jacketed hollow point". ^ "Declaration IV,3 – On the Use of Bullets Which Expand or Flatten Easily in the Human Body". Hague Convention of 1899. 1899-06-29. Archived from the original on 2010-12-18. Retrieved 2010-12-16. ^ a b "Hertfordshire Constabulary Firearms Licensing" (PDF). Archived (PDF) from the original on 2011-09-26. ^ Chuck Hawks. Centerfire Cartridge Fundamentals. Chuck Hawks. ^ "Deer Act of 1991 (c. 4) (page 2)". Archived from the original on 2008-09-07. ^ "Army to consider hollow point bullets for new pistol". Retrieved 2015-10-23. ^ "Transportation and use of hollow point ammunition by sportsmen". New Jersey State Police. Archived from the original on 17 September 2013. Retrieved 3 September 2013. ^ Carter, Gregg Lee (2002). Guns In American Society: An Encyclopedia. ABC-CLIO. p. 64. ISBN 978-1-57607-268-4. ^ Petersen, Julie (September 1993). "MotherJones SO93: This bullet kills you better". Mother Jones. Archived from the original on 2007-03-12. Retrieved 2007-03-17. ^ "Winchester Ranger Talon (Ranger SXT/Black Talon) Wound Ballistics". Tactical Briefs #2. Firearms Tactical Institute. 1998-03-01. Retrieved 2007-03-17. His absurd claim that this bullet gradually expands as it penetrates simply defies the laws of physics, and is based on fantasy. ^ Hallinan, Joe (1995-01-29). "Black Talon: much ado about little". Newhouse News Service. Cited in Jeff Chan (1995-03-27). "Letter to CNN". RKBA.org. Archived from the original on 2006-11-14. Retrieved 2007-03-17. Dr. Stephen Hargarten of Milwaukee, spokesman for the American College of Emergency Physicians stated that to the best of his knowledge no emergency room physicians or medical care providers had ever been cut by the Black Talon round while treating a patient. ^ "Winchester Ranger T-Series". Winchester. Archived from the original on 2011-10-05. Retrieved 2011-10-25. ^ "Winchester Supreme Elite Bonded PDX1". Winchester. Archived from the original on October 10, 2011. Retrieved 2011-10-25. ^ "Dum Dum". Encyclopædia Britannica. 2016. Retrieved 2017-10-31. ^ "DUM-DUM CARTRIDGES" (PDF). The New York Times. January 4, 1886. Archived (PDF) from the original on March 1, 2017. ^ "Man who pointed gun at police gets 5 years". Evening Times. Newsquest. 2007-03-09. Archived from the original on September 30, 2007. Retrieved 2007-03-23. Police almost shot Steven Bowman, 38, when he was waving a rifle loaded with a dum-dum bullet on a bridge over the M8 in Easterhouse, Glasgow. ^ "Review of Crimson Skies - RPGnet RPG Game Index". www.rpg.net. Retrieved 2018-02-04. History of commercial hollow-point bullet molds, going back to the 1890s. Premium Rifle Bullets: Who Wins The Toughest Test? Precision Shooter, March, 1996. A comparison test of four different .30-06 hollow-point bullets, showing how performance is measured and compared. 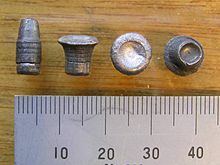 Wikimedia Commons has media related to Hollow-point bullets. High speed video clips of several Barnes expanding bullets on impact. The 180 grain .308 bullet shows an ideal mushroom shape in the ballistic gelatin, and clearly shows the ripples in the temporary cavity formed by the spinning bullet. This page was last edited on 9 March 2019, at 05:10 (UTC).